What a fun afternoon! I love getting all the kiddos together and watching them create. We started these “Crafternoon” get togethers last October and I hope we continue for a long time. 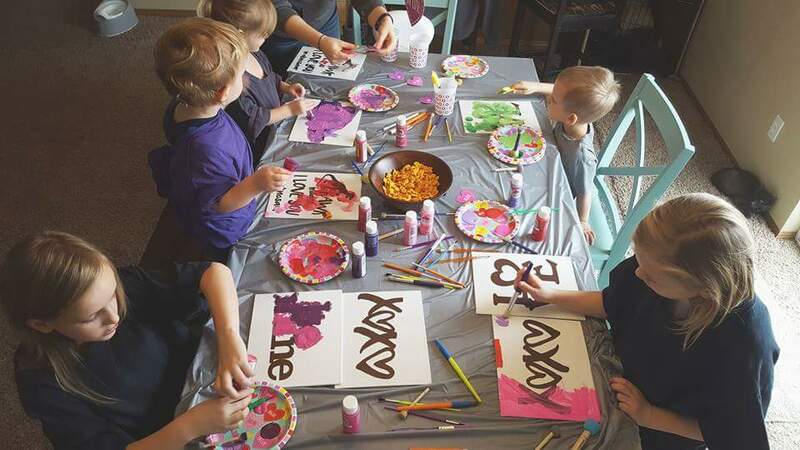 This month being the month of all things pink and hearts related we did a Valentine’s Day craft. I like when I can display a project year after year instead of it just going in the trash at the end of the month so I decided to use canvases for this project. All the kids that come are 5 and under (except this time a few older siblings came) so we feed the masses then let them run around like the crazy kids they are. After most of their energy is spent they get old shirts to cover their clothes and away they go! Paint usually ends up more on my kiddo then his project but that is part of the fun! The freedom the be messy and creative! Previous Post Cooper Turned 2! Next Post Cooper Is Going To Be A Big Brother!